Today, store shelves are packed with products for teeth sensitivity, including many brands of desensitizing toothpaste. Since some are specialized for certain cases, ask an affordable dentist to recommend the ones that are right for you and follow their brushing guidelines. Brush for two full minutes. Avoid harsh scrubbing since that can speed up enamel erosion and teeth sensitivity. Did you know that acidic foods and drinks eat away at your tooth enamel? The most damaging and dangerous are citrus fruits, pickles, soda, red wine, and fruit juices. Since it’s hard to avoid them altogether, try limiting your intake and brushing your teeth about 20 minutes after eating them. Brushing any sooner can cause further enamel erosion and teeth sensitivity. Protect your teeth from further damage by having protective resins applied to sensitive spots on teeth. These coverings are brushed onto teeth and provide outstanding protection from greater enamel erosion. Just realize that these varnishes only last for a limited time before they need to be reapplied. Talk to an expert in family dentistry to see if these coatings can shield your smile. Some people grind their teeth while asleep and don’t realize they have this harmful habit until they have unexplained jaw pain and headaches. 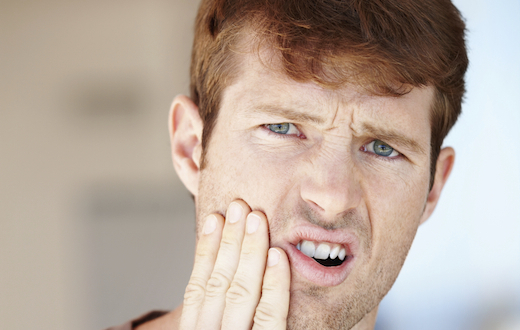 Teeth grinding gradually wears down enamel and can do major dental damage. If grinding is becoming a daily grind, remind yourself to relax your jaw throughout the day, sleep in a different position, or get a mouth guard from an affordable dentist. If you have receding gums, an expert in family dentistry may be able to repair the recession with a treatment called tissue grafts. This restorative treatment takes other tissue and applies it on sites of gum recession. This encourages new tissue growth where gums have been worn away.